A modified LED fluorimetry determination of uranium in Nb/Ta minerals has been developed. The mineral is brought into solution by fusion with mixed phosphate flux (NaH2PO4, H2O and Na2HPO4). Iron quenches uranium fluorescence when it is present above the ratio of (iron to uranium) 100. Uranium is separated in ethyl acetate by solvent extraction and then stripped back into pyrophosphate buffer (pH ~ 7) prior to its LED fluorimetry determination. 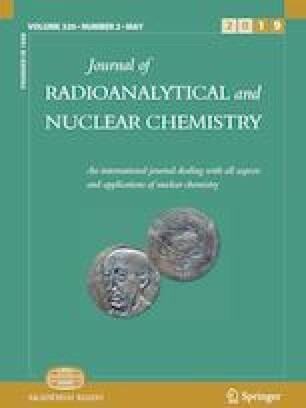 This modified method has been applied for the determination of uranium in synthetic mixtures and Nb/Ta minerals including Certified Reference Materials (X1807) with high degree of accuracy and precision. The authors express their sincere thanks and gratitude to Directors, AMD, Hyderabad and NIT, Jamshedpur for their kind permission to do research work leading to Ph.D. The authors are also thankful to Regional Director and Dy. Regional Director, AMD, Eastern Region, Jamshedpur for providing necessary facilities to carry out the work. Also, the authors are thankful to Head, Chemistry Group, AMD, Hyderabad and Dr. Vijay Kumar, Incharge, Chemistry Laboratory, AMD, Jamshedpur for their constant encouragement, support and motivation to do the work. Special thanks to Shri Amit kumar, research scholar, NIT, Jamshedpur for his non-technical support.